(Nanowerk News) What if peanut brittle, under certain conditions, behaved like taffy? Something like that happens to a two-dimensional dichalcogenide analyzed by scientists at Rice University. Rice researchers calculated that atomically thin layers of molybdenum disulfide can take on the qualities of plastic through exposure to a sulfur-infused gas at the right temperature and pressure. That means one can deform it without breaking it — a property many materials scientists who study two-dimensional materials should find interesting, according to Rice theoretical physicist Boris Yakobson and postdoctoral researcher Xiaolong Zou; they led the study that appeared in the American Chemical Society journal Nano Letters ("Environment-Controlled Dislocation Migration and Superplasticity in Monolayer MoS2"). Molybdenum disulfide, the object of study in many labs for its semiconducting properties, interested the Rice lab because of the characteristics of its grain boundaries. Two-dimensional materials like graphene are actually flat, atom-thick sheets. But 2-D molybdenum disulfide is a sandwich, with layers of sulfur above and below the molybdenum atoms. When two sheets join at different angles during growth in a furnace, atoms at the boundaries have to compensate by improvising “defective” arrangements, called dislocations, where they come together. The researchers determined it may be possible to promote the movement of those dislocations through environmental control of the gas medium. 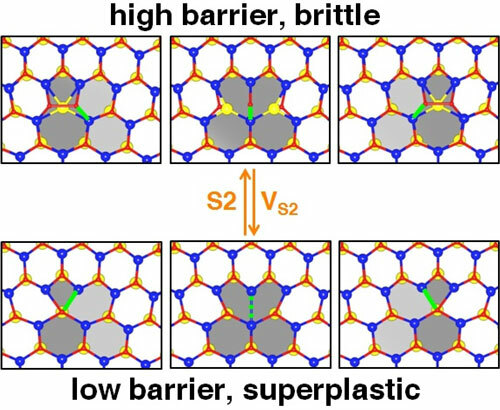 This would change the material’s properties to give it superplasticity, which allows it to be deformed beyond its usual breaking point. Plastic materials can be rearranged and will hold their new shape. For example, a plumber can bend a metal pipe; that bendable quality is plasticity. Yakobson noted such materials can become brittle again with further changes in the environment. 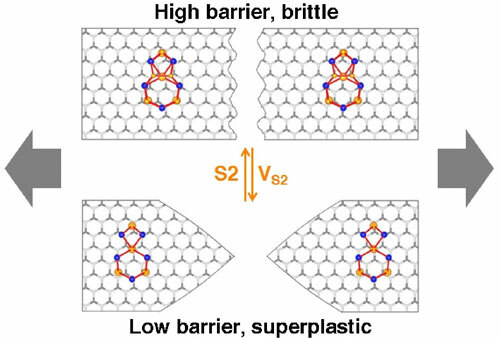 For molybdenum disulfide, they found two mechanisms by which boundaries could overcome activation energy barriers and lead to superplasticity. In the first, called direct rebonding, only one molybdenum atom in a dislocation would shift in response to external forces. In the second, bond rotation, several atoms would shift in opposite directions. Yakobson suggested it may be possible to tune the plasticity of dichalcogenides in general and that it may also be possible to eliminate the defects from a 2-D dichalcogenide sheet by treating the dislocations “to allow them to rapidly diffuse away and vanish or to form interesting aggregated states.” That would likely open the way to the easier manufacture of dichalcogenides that need particular electrical or mechanical properties for applications, he said.